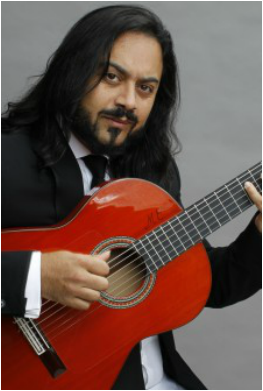 Flamenco Guitarist & Composer, Descendent of great guitar figures Ramón Montoya and Mario Escudero. He has accompanied many world renowned Spanish artists such as singer Diego "El Cigala" and Flamenco dancer Joaquín Cortés. Antón appears in the movie “Flamenco” by Carlos Saura. After winning the 1995 national guitar award in Spain, he collaborated as guest artist with U2 at the Palau San Jordi. Since then he has composed music for and collaborated on recording projects with many Spanish artists. Anton has toured the world performing as a soloist as well. More recently Anton was the producer, co-director and musical composer of the original music for the film GUITARRA DE PALO. Filmed on three continents, it unites great musicians of Flamenco and Jazz the likes of Jerry Gonzalez, Lola Greco, Raimundo Amador, Jorje Pardo, Javier Colina, Antonio Serrano, amongst others.